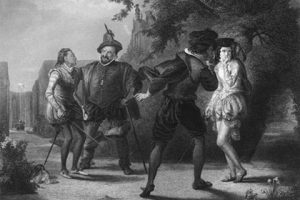 Ben Jonson Definitely Killed A Man – WTH(istory)? Whenever the name ‘Ben Jonson’ is brought up in a conversation, ‘duelist extraordinaire’ is probably the last thing that comes to mind. But that’s exactly what he was, and he got away with it too. Jonson was a British poet and playwright who was born on June 11th, 1572 in Westminster. He was raised by his mother and stepfather, a master bricklayer, in Westminster and attended the Westminster school as a child, learning from some of the greatest classical scholars of the time. After deciding not to go to university, Johnson became a bricklayer himself for a short period of time, followed by a brief stint in the British Army, where he served in the Netherlands. In 1594, Ben married his wife, Anne Lewis, and began his work as a playwright and actor. He finally caught his first big break in ’98 as a playwright with his play Every Man In His Humor, which opened merely days before his infamous duel with actor Gabriel Spenser. Though the reasons behind the duel remain unknown to this very day, rumor has it that it was Spenser that initiated the duel with Jonson on September 22nd, 1598 in Hoxton Fields in Shoreditch. Looking back at the duel, Jonson admitted that Spenser even had the longer sword, a large advantage in traditional sword-fighting. However, as we all know, what matters most isn’t merely the length of one’s sword, but the skill with which one uses it. After Spenser was able to use his larger sword to land a light wound to Jonson’s arm, but Jonson then was able to counter and kill Spenser with a 6 inch gash to Spenser’s right side. The benefit of clergy was a right to each “clerk” (a member of the clergy that is below the priest) accused of a capital offense to be granted immunity from punishment in secular courts. This was commonly used in Jonson’s time as a means for mitigating harsh criminal law for a layman convicted of a capital offense, as Jonson was, by considering them a clerk and giving them clerical immunity if he could prove that he could read, most often the 51st Psalm. Jonson was able to recite a few of these lines in court, and so was able to make a valid claim to the benefit of clergy. Because of this he was tried as a clerk, and as a result his punishment was reduced from likely execution to forfeiture of property and the branding of his left thumb. 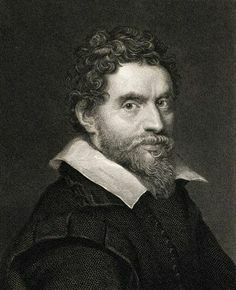 After the duel and its following trial, Jonson went on to become one of the most prominent playwrights in all of Britain, second only to William Shakespeare, much to Jonson’s dismay. He was as famous as Shakespeare in their day, and was famous for his witty remarks and engaging in verbal debates at pubs, such as the Mermaid Tavern. Because Jonson only had one prominent play at the time of his duel with Spenser, Every Man In His Humor, and that play had its first performance merely days before the duel, Jonson’s trial received little literary and cultural attention. Had this duel occurred at the height of Jonson’s prominence as a playwright, however, the trial would have likely received enormous national attention and coverage. Though many would revert to stereotyping Jonson as a fat poet with a big appetite, in reality he was so much more: a man who enjoyed the occasional fight to the death, and one who had a penchant for bar arguments and fights. The man, the myth, the legend; he was Ben Jonson.